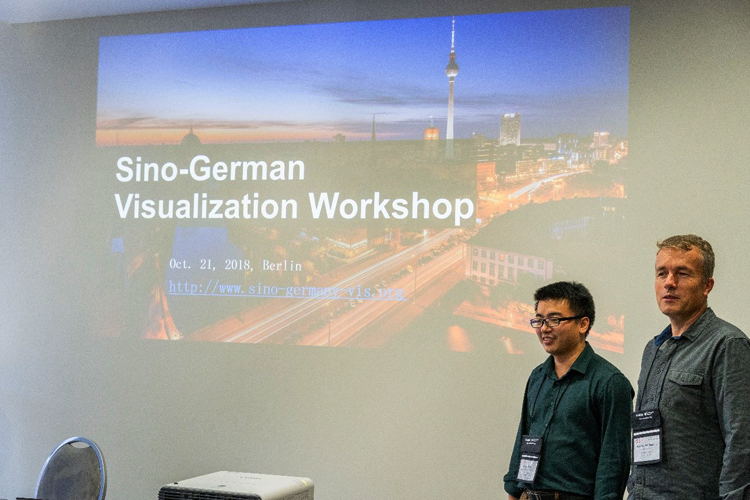 The second Sino-German Workshop on visualization was held in the Estrel hotel, Berlin, Germany on 21st, October 2018, co-located with IEEE VIS 2018. This workshop aimed at bringing together German and Chinese researchers in the field of visualization and was co-organized by Prof. Yunhai Wang from Shandong University, China, and me. Over 40 participants from German and Chinese Universities including University of Konstanz, University of Stuttgart, University of Bonn, Shandong University, Zhejiang University, and Peking University were brought together. The workshop was supported by the SFB-TRR 161 “Quantitative Methods for Visual Computing” of the Deutsche Forschungsgemeinschaft. Prof. Yunhai Wang (Shandong University, China), and me, Oliver Deussen (University of Konstanz), during the openting of the Simo-German Visualization Workshop. The workshop mainly consisted of three parts: two keynotes, an introduction of Chinese and Germany PIs and a poster session, details can be found under http://www.sino-germany-vis.org/. After a briefly introduced the Workshop by Prof. Wang and me, Prof. Kwan-Liu Ma from UC Davis gave a keynote about “Visualization Research: Reviews and Perspectives.” Prof. Ma reviewed several research achievements of his group over the years and proposed his comprehension of visualization and future expectations of this area. Later, Prof. Hans-Christian Hege from the Zuse Institute Berlin gave a second keynote “My View on the Future of Visualization”, explaining his views on visualization in a mathematical way. He talked about visualization breakthroughs and developments from the 1950s towards today and his expectations on future improvements in this field. Kwan-Liu Ma and Prof. Hans-Christian Hege during their keynote talks. In the second part, visualization researchers from Germany and China introduced their university and research projects. Besides Wang and me, Prof. Daniel Weiskopf from the University of Stuttgart and Prof. Yincai Wu from Zhejiang University presented in this session. This way, the students were enabled to explore potential collaborations for the future. Yunhai Wang, me, Daniel Weiskopf, and Yincai Wu (from left to right) spoke about their research activities and institutions. The last session was poster presentations and discussions. Master and Ph.D. students from Germany and China introduced their research through posters and discussed with professors and each other. These discussion provided them deeper insights into their projects and inspired them for future research directions. More than 40 participants from German and Chinese Universities took part in the Sino-German Workshop in Berlin. Oliver Deussen is a professor at University of Konstanz, heading the work group on computer graphics and media design, as well as the vice speaker of the SFB-TRR 161. His special research interest are complex images of flowers and plants. Together with his team he concentrates on the modeling and visualization, the visualization of complex software structures and on non-photorealistic renderings.